You might be surprised about concussions in sports other than football. Football has received tremendous scrutiny over the long-term dangers of concussions. At the high school and college levels, football has a higher rate of concussions than other sports. However, concussions do occur in other contact and collision sports, and they can be just as dangerous. We need to do everything possible to decrease the risks of concussions in sports, not just football. We won’t prevent every head injury, but we can make a difference. For example, boys’ and girls’ soccer both have high rates of concussions. Scientists debate the long-term effects of heading the soccer ball, but we can work to prevent serious brain injuries in the sport. We need to teach proper heading techniques to decrease the chance of head-to-head contact with another player and also teach proper landing techniques to try to prevent players hitting their heads on the ground. We might also consider placing pads on the goalposts to protect goalkeepers. Between 1998 and 2008, concussions in cheerleading increased by an average of 26% per year. This increase is larger than that of any other girls’ sport. Since a majority of these injuries occur in stunts, cheerleaders should be trained in proper techniques for spotting and stunting. Each athlete should only attempt stunts after she has demonstrated the technical skills required for each maneuver. Those are just a few sports and ideas for them. If you play any contact or collision sport, you can suffer a head injury. Learn how to best protect yourself. Finally, if you coach a sport, or if you are a parent of a child who plays one of these sports, learn to recognize the signs and symptoms of a concussion. A concussed athlete could exhibit a headache, confusion, dizziness, nausea, vomiting, memory loss and more. 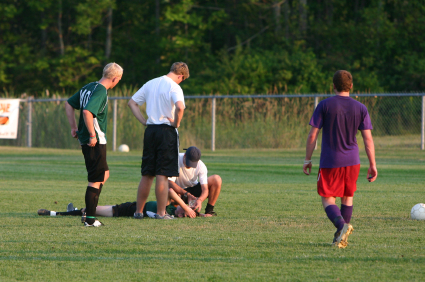 If there is any doubt at all that you or one of your players has suffered a concussion, get medical attention from a doctor or athletic trainer on the sidelines. Alternatively, go to a medical facility for proper evaluation and treatment. Episode 134: What has Tommy John surgery meant for baseball?